David Attenborough and the team behind Blue Planet tend to be the first names that spring to mind when thinking about beautifully shot wildlife epics - and for good reason - but there's a new show in town with an innovative approach. Animals with Cameras may well sound like a feature idea pitched by Alan Partridge but Gordon Buchanan, the award-winning Scottish wildlife filmmaker behind Tribes and Life in the Snow, fronts the new series that gets up close and personal with nature. The premise is fairly simple: strap an array of cameras to meerkats, chimps and other creatures to get an insight into their behaviors and characteristics that simply observing them wouldn't allow. The man tasked with rigging a cheeky four-year old chimp, a group of inquisitive penguins and many more animals with the latest POV camera kit is Chris Watts, an experienced camera designer and cameraman. 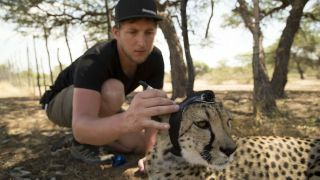 Speaking to TechRadar, Chris said, "I wanted to get involved in this project because I really believe the show is different, because rather than just putting a camera on an animal for a few moments to get a cool shot, we have worked alongside scientists to really try and discover something new about their lives." "As a cameraman, I’m always looking for new ways to tell stories and new advances in technology are often a great way to help do that. In terms of capturing animals, what better way is there than to have the opportunity to develop cameras for them to film themselves and tell their own narrative?" he adds. One of the main challenges Chris and his team faced was the distinct lack of existing technology required to affix to an animal in order to capture its habits and movements. "There were so many challenges to face during this project, which began when I was tasked with shrinking down a high quality camera - with long lasting batteries - into a small package," Chris explains. "The tiny units then had to include custom built programmable controllers for setting recording windows, with built in release mechanisms, as well as GPS and VHF to find them again afterwards." An array of camera designs had to be completed before filming commenced and Chris was tasked with packages that ranged from an ultra-lightweight rig that could be worn by a meerkat (it couldn't weight more than 25g), to a robust package that could withstand a beating from a wild bear, as well as capture footage during the day and night. Chris claims that he used, if not deconstructed, tore apart and tested, almost all the main action cameras on the market to construct his bespoke snappers. The POV shots captured by Chris and the team are not only stunning to behold, they also gave scientists previously unseen footage of the animals in their natural habitat, revealing new behaviors and traits. To achieve this, Chris had to be very specific with the technology he used, adapting it to suit the animal and its habitat. "The lenses used for most of the cameras tended to be as wide angle as possible to help with stability of the shot, but also help us see with a field of view similar to the animal," Chris says. "The main lens fitments were M12 lenses, which can be commonly found on CCTV, webcams and action cams. The meerkat lenses were the smallest M7s and involved heavy modifications to take a higher quality lens. "But the most special, in my opinion, was the cheetah lens, because it actually had a stabilized sensor behind it that really helped smooth out the cheetah’s running," he adds. Of course, nature has a long history of not cooperating with television crews and Chris claimed he spent long hours in the field making adjustments, servicing and repairing his creations so they were primed for action the next day. "We didn't have the luxury of camera shops when we were out in these remote places filming," says Chris. "Many of the cameras ended up a bit ‘Frankensteined’, which meant I had to take working parts from one unit and place them in another." If you're in the UK, you can see Chris's handiwork when the first episode of Animals with Cameras airs on BBC One on 1st Feb at 8PM. If you're in the US, you get to see it a day before on January 31st on PBS, but the time is to be confirmed.